After another weekend spent moving furniture around, climbing up and down a stepladder eleventy billion times, and praying that I wouldn’t mess up the carpet every few seconds, I’m happy to report: the master bedroom is no longer pinky beige! Let’s celebrate! For whatever reason, this northern-exposure bedroom usually felt the pinkiest of the pinky-beige. 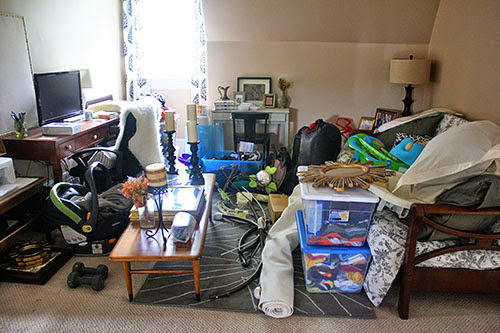 Super frustrating when I was trying to create a space that felt relaxed and “ours” – two things pinky-beige could never connote! I usually delight in a good light blue, but the whole thing came across as pastel blue with pastel pink and... no. Just no! But I thought I’d go one shade on the chip darker for our bedroom. I love a good dark, cozy bedroom to contrast with bright living areas, and I also knew the amount of light this room got (despite the northern exposure) could take a darker tone. 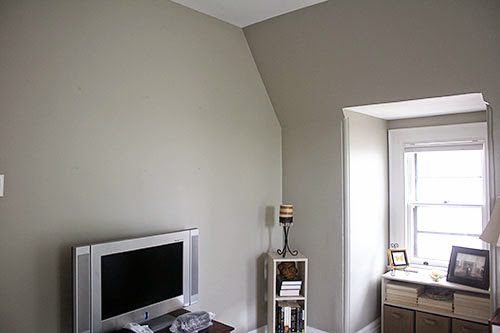 One shade darker = Amazing Gray, one of my paint color hero Emily A. Clark’s favorites! The color is looking a little washed out here (why is it so dang impossible to photograph grays?) but hopefully you get the idea. Similar to the guest room, one click darker! With paint in hand, Mr. P and I cleared out most of the smaller furniture and items on the walls. The office was already an insane mess of our incredible inherited baby haul, so why not make it worse? That part is always when I question whether painting is a good idea or not. You have to take a step back to move forward, ugh! Then it was time to get to work! Sometimes at night, sometimes in daylight, but either way, these comparison shots show how much the color was a vast improvement. 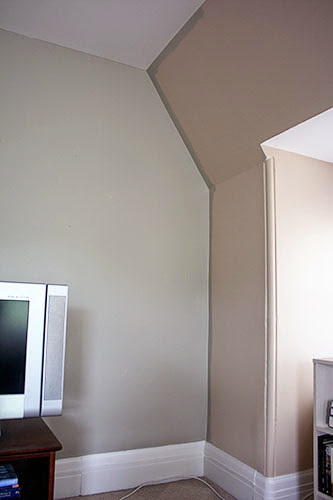 It sounds silly to say this out loud, but before I started painting this apartment, I didn’t realize how much more difficult it is to paint sloped walls. 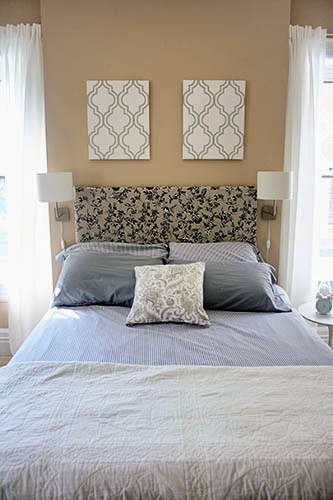 When walls are perfectly vertical from floor to ceiling, you only need to move furniture two to three feet away (just enough to squeeze in a ladder and dropcloth). 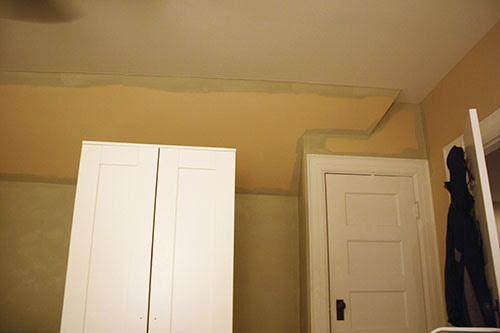 But to be able to cut in where the sloped wall meets the ceiling, the furniture had to come out further into the room. Fortunately our rooms are quite large, but I had to use every bit of floor space to be able to access the walls by ladder! 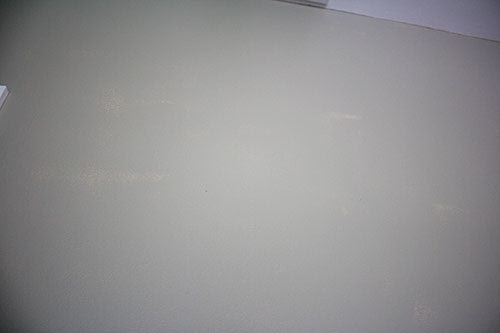 I should mention, as an expecting lady, that Behr Premium Plus paints are already low-VOC (not necessarily endorsing Behr, just stating what I could find after a bit of research). So while I would like to get our place painted well before the little one arrives in case of lingering VOCs, I don’t feel like it’s dangerous for me (or him) right now. The paint smell isn’t strong, and it’s basically gone after a day or two! After I went all the way around the room, I had to do it a second time. 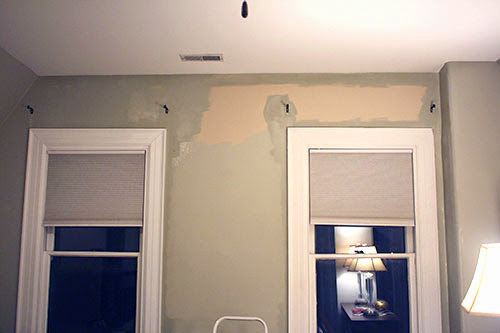 I didn’t do a great job with coverage after the first pass because the wet paint color was too similar to the pink. It was quite obvious once it dried, though! And after 80% of a mediocre Dan Brown audiobook (unit conversion: one mediocre Dan Brown audiobook = 18 hours) I was done! 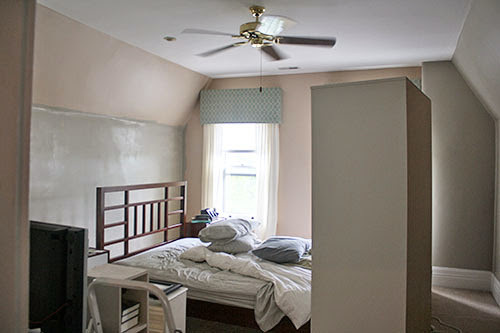 The room isn’t totally back together yet – I like the paint to cure for a few days before putting things back on the wall – but it’s still already such an improvement. I can’t wait to have my white curtains up against the gray! LOVE. 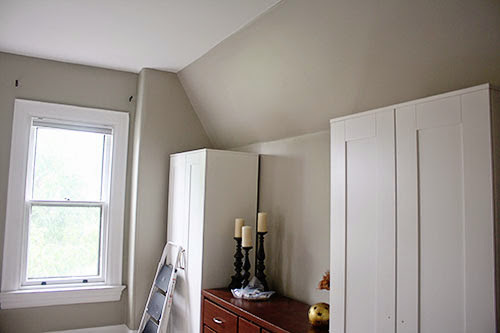 One very slight disappointment: the dark Amazing Gray in a bright room looks basically the same as the Worldly Gray in an adjacent dark room (the foyer) – except for the undertones! I suspected they might look similar and thought the Amazing Gray might even help the foyer seem not-so-dark in comparison. But if you’re an undertone hawk like me, you might notice that Worldly Gray is a bit redder in undertone, while Amazing Gray is slightly greener. 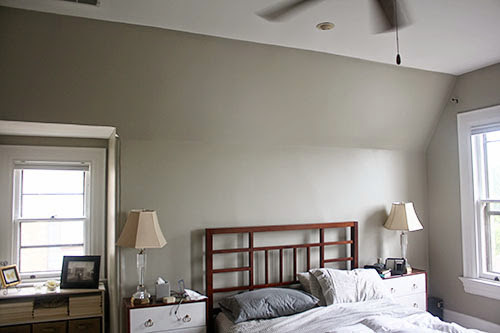 It’s something most people would never see, and it might be due to getting color-matched Behr instead of Sherwin Williams. Fortunately it’s not a huge disappointment (as no one will ever notice this but me, and even to me it isn’t that obvious), but it was something I’d hoped to avoid. Oh well! I’ll just count my no-longer-pinky-beige blessings instead. Two rooms down, three to go! So very good to get to see you and Mr. P for lunch yesterday! And afterwards getting to actually see this transformation in real life! It is Amazing! You are so right about the beige looking even pinker against the blue beforehand. 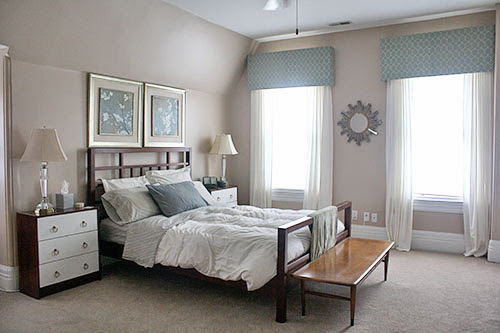 No longer does the room's color scheme feel like an off-putting homage to the blue and mauve era of the 80's. It is sooo much more inviting and rest-inducing. So although I fear the part about the pregnant-lady-climbing-a-ladder to accomplish this beautiful look, the 3-stories worth of switch back stairs she is also climbing multiple times daily more than deserves a peaceful respite like this at the top! You are even more Amazing! The room looks amazing. Never underestimate the power of paint. Out of curiosity, why did you choose to have Behr color match the SW colors versus purchasing the colors from SW? With SW frequent sales, I'm not sure how much of a price difference there is. @Rachel, I probably could have stalked SW for sales, but with a pressing timeline, I needed to get this done ASAP rather than wait for a sale. My landlady also gets a 20% discount on paint from Home Depot that she was willing to let me use. If it was my own home (especially a forever home) and I had more time, I might've waited for SW, but the Behr route just seemed easier! That makes complete sense! After using SW paint a few times and Valsar once, I've become a total SW snob. 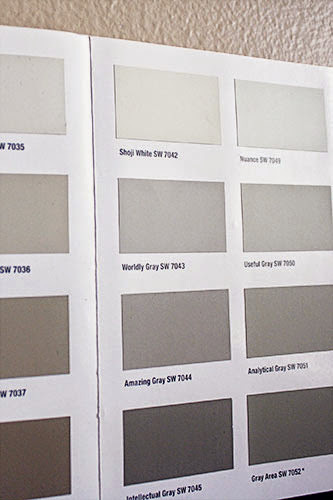 Plus, I would be terrified that color matching would affect the subtle undertones and differences in grays. 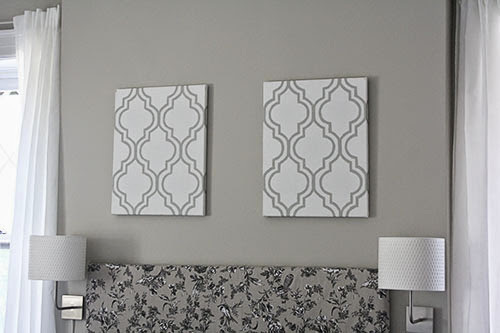 However, given your time frame and the fact that you finally worked up the energy to paint, Behr all the way! work is paying off in your beautiful home. @Debbie, I only ever painted the metal parts of my ceiling fans (as you can see here), and for that, I did take it apart to spraypaint them. Honestly, if it were me, I'd take them apart to spraypaint to get the best finish. But if you can't, perhaps you could use this Martha Stewart brand of ORB to paint them in place?